I have learnt all the techniques for my black belt grading so now begins the real work to ensure they are all up to scratch so it's been training, training, training whenever I can. I am, however, struggling with the first set of the two sets of techniques I need to master to successfuly grade. 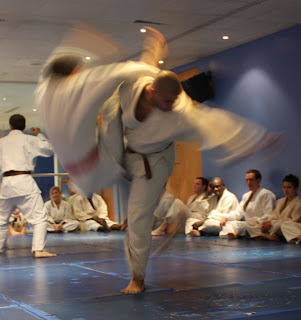 These are essentially attacking techniques where there is no momentum coming at you so you have to generate the momentum from your opponent who is in a standing position by utilising correct posture and maintaining a firm base while taking then disrupting your opponent's balance. And it's hard work. When an oponent's momentum is coming towards you it's much easier to merge with it and redirect it because he's essentialy jeopardising his base to begin with. But when he's not it's much harder. Fortunately I was playing pool one night this week and I'd left myself a virtually impossible shot to dislodge a ball and a penny suddenly dropped after I'd played the shot. The ball was an easy enough pot but it was a one in a hundred shot to generate the angle or the position needed off the pot to move my last ball off the cushion to make it pottable. But instead of getting annoyed I relaxed and just committed to the shot and cued it so well that I actually managed to do it. Even my watching colleague, a player and a peer of many years experience, couldn't believe the shot I'd played. So the lessons for hapkido are to commit to the shot (or the attack) and rely on and trust the technique. After all I only managaed to cue the ball so well because everything was aligned correctly. This type of alignment also applies to hapkido. Martial arts, like pool, starts with a firm base from the floor then ends with well-executed movements elsewhere. It also relies on a mental commitment to each and every shot. After all laziness on easy shots usually results in missed shots. It sort of makes sense to me. To paraphrase Musashi, if you can the find the way once you can find it ten thousand times and when it comes to pool I know the way so I need to copy the lessons.